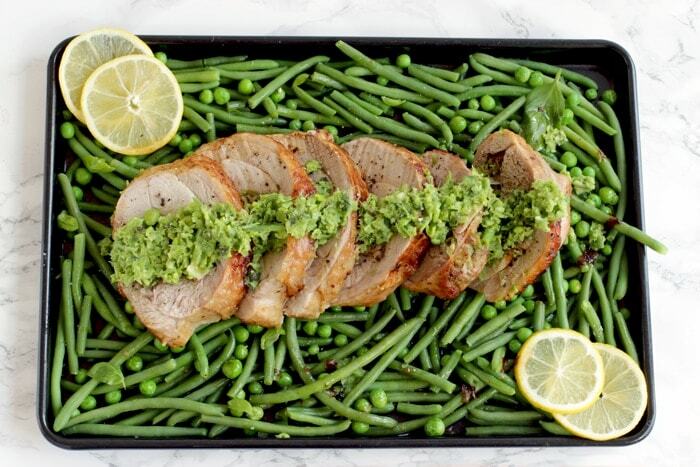 This Gluten-free Turkey Roulade with Basil and Pea Pesto makes a showstopping holiday meal with very little effort and in less than 1 hour. Happy Thanksgiving friends! May your day be filled love, plenty of laughter and of course delicious food! I love this american and canadian holiday. We don’t get to have Thanksgiving in Italy or UK, so here in London sadly it’s just another regular rainy day. I love the spirit surrounding this special occasion, but I like to remember to be thankful EVERY day, and not just once a year. And because I don’t write it often, I want to THANK you for being awesome, for sending all your cheerful messages everyday, and for experimenting and loving my recipes. Thank you for making The Petite Cook possible :). Now, I may be an italian-born, uk-living young lady, but I wanted to celebrate Thanksgiving too. So, if you like me didn’t have time to prep a fancy dinner or roast a whole bird today, fear not. I have come up with just what you need on these special occasions. 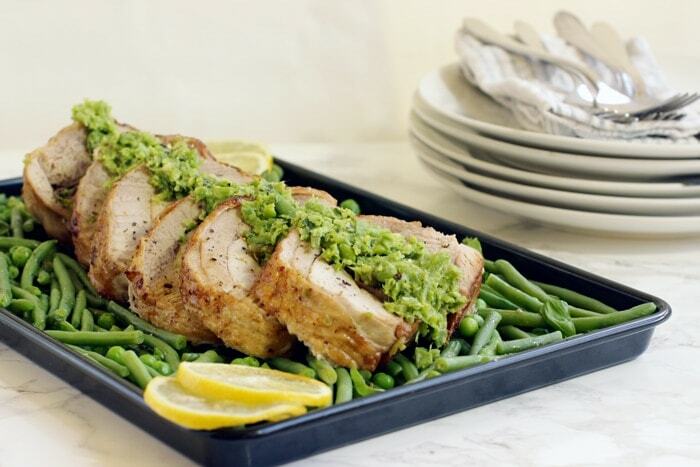 This Turkey Roulade with Basil Pea Pesto is the perfect last-minute holiday dinner. Easy to make in less than 1 hour and only requiring simple fresh ingredients. You’ ll just need a free-range turkey tight ( easy to find in most grocery stores) and some garden greens including fresh/frozen peas, basil and green beans. You can also fold in some sliced Parma ham as I did, or go for sliced bacon, normal ham or your favorite hard cheese. No bread is involved, so this dish is also naturally gluten-free. Start by making an awesome pea pesto. Simply put steamed peas, basil, oil and seasoning in a Vitamix ( or equally powerful blender) and blend until creamy but still chunky. If you like the pesto to be smoother, add a little more olive oil and let it blend for a little longer. You can also opt for a classic basil pesto or a refreshing rocket pesto, they’re both equally delicious. Arrange the deboned turkey leg flat on a work surface and layer with Parma ham. Top with a couple of spoons of freshly-made pea pesto and season lightly. Roll the turkey tightly but gently over itself, making sure the filling doesn’t escape. 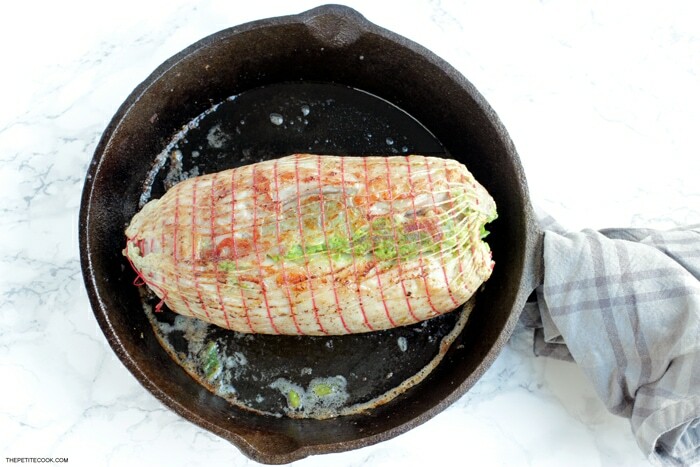 Secure your turkey roulade with meat netting, or use a kitchen string. Sear the roulade evenly on a screaming hot cast iron skillet, about 3-4 mins on each side. This will help seal all the meat juices while you cook the turkey in the oven. Transfer the turkey in the oven and bake until an instant-read meat thermometer inserted in the thickest part registers 165°F, about 45 mins-1 hour. Remove the turkey from the oven, transfer to a cutting board, cover with aluminum foil and let rest for 5 mins. Then cut into thick slices, spoon over all those delicious pan juices and serve with your favorite greens and extra pea pesto on top. Et-voila! This tasty and awesomely healthy main course doesn’t require much efforts and delivers a stunning meal packed with refreshing flavors. Don’t forget to make the most of turkey leftovers – if any-, I’ve used mines to fill an awesome sandwich made with these sweet potato waffles. Great for a heart-warming weekend breakfast and/or brunch! 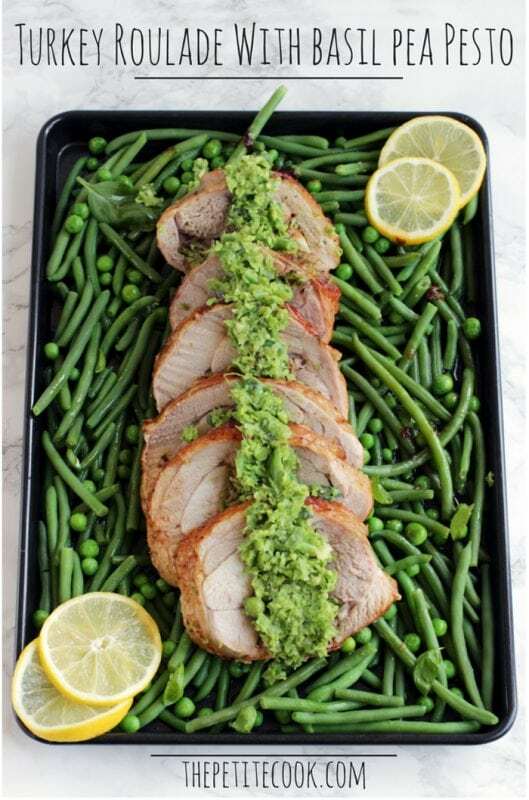 With Christmas and New Year’s Eve just around the corner, this turkey roulade with basil and pea pesto will make a showstopping holiday meal in less than 1 hour, leaving you plenty of time to enjoy your guests company. Place the deboned turkey leg between two sheets of plastic wrap and pound lightly with a flat meat tenderizer to an even thickness of about 1 inch. Set aside while you prepare the stuffing. 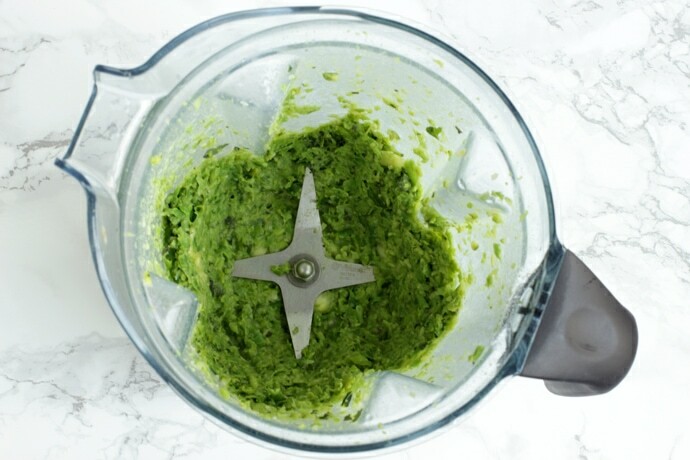 Place all the pesto ingredients in a large powerful blender and blend until smooth but still chunky. Season and set aside until needed. Arrange the turkey leg on a flat clean surface and layer the parma ham over the top (if using). Spread about 3 spoons of pesto on top, leaving out about 1 inch of the edges. Roll the turkey tightly but gently over itself, making sure the filling doesn't escape. 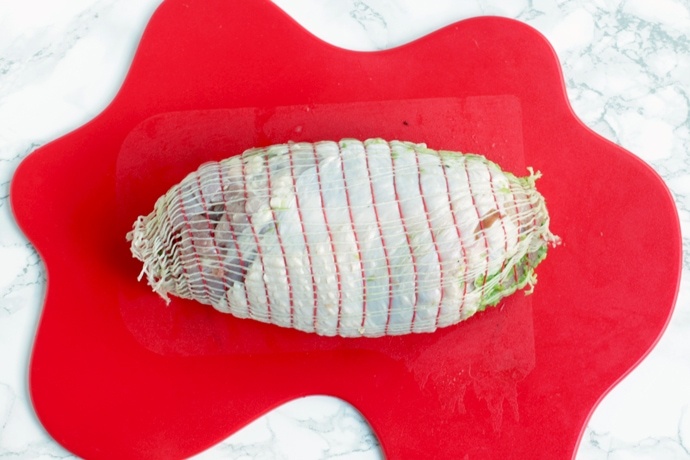 Secure your turkey roulade with meat netting, or use a kitchen string. Give the roulade a quick seal and sear all sides on a screaming hot cast iron skillet. This will help seal all the meat juices while you cook the turkey in the oven. Transfer the turkey in the oven and bake until an instant-read meat thermometer inserted in the thickest part registers 165°F, about 45 mins-1 hour. Remove the turkey from the oven, transfer to a cutting board, cover with aluminum foil, and let rest for 5 mins. 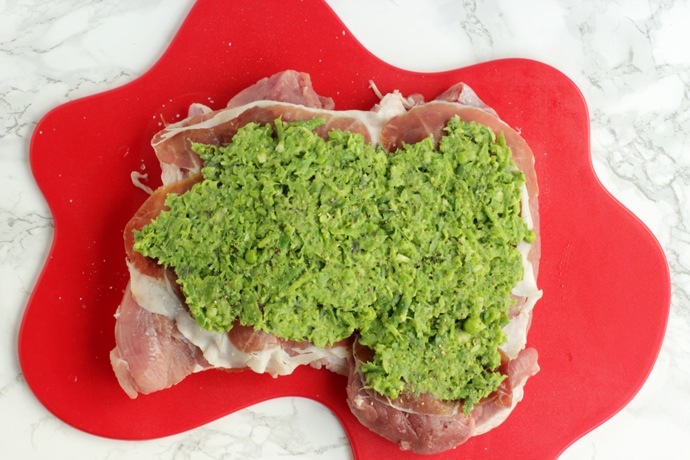 Cut the roulade into thick slices, spoon over the pan juices and serve with your favorite greens and extra pea pesto on top.